My previous experience with KUM sharpeners wasn’t very good. Some of the models I have are good, some are not so good and overall I usually prefer sharpeners from other brands. You might remember that the Staedtler Wopex is a difficult pencil to sharpen. Nevertheless, I like it so much that on an average day it is my most used pencil. Even though sharpening it with a knife yields good results I thought I should try sharpening the Wopex in KUM’s Automatic Long Point 2M, a sharpener I haven’t used in a while because of the unsightly marks it leaves at the base of the exposed graphite1. To my surprise I got fantastic results when I used it to sharpen a Wopex. I get best results if I align the Wopex with the top of the sharpener during the second step. If you have a Wopex and the Automatic Long Point 2M try them out. My Long Point sharpener performs much better than the dedicated Wopex sharpeners I have. Pencil talk has a review of KUM’s Automatic Long Point 2M. Excellent news! I really enjoy the Wopex but, like you, dread when I have to sharpen one. My burr sharpener did a pretty good job, but the autostop failed and wasted a length of pencil before I noticed. 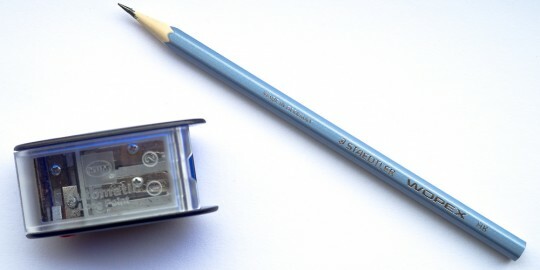 I wish KUM would make a metal version of this sharpener. A brass cast of the inset sharpener (the grey plastic part) would be an AMAZING sharpener! Well done Matthias, excellent results, although as you say, you do need to align the pencil with the top of the blade on the second stage and take plenty of care. I now have a reason to use the KUM longpoint again. Hmm my main gripe with the KUM long point sharpener is that the hinged plastic lid tends to break under regular use, but it is nice to learn that it works well with the Wopex pencils. John, a brass version would be nice! The improvement I would like to see is a version that produces a less unsightly lead where graphite and wood meet (produced after the first step). Maybe my sharpener is just misaligned and others KUM Long Point’s sharpen ‘nicer’. Kevin, I even think the point from the Long Point doesn’t break as easily as the point created by most other sharpeners. We definitely should! You never know. They make custom Longpoints for Cal Cedar. Maybe we can talk them into a small run with the current mold, as a block sharpener. I like that it just uses the normally-sized KUM blades. Wow, 3 years already! Congratulations, Memm. Memm, don’t be shy – a 3 year post please. We don’t want these congratulations hidden in a wopex thread. Anyhow, well done on the milestone. I was actually planning to get a post out on the anniversary date, but didn’t find the time to finish it yet – only half finished. I’ll hope to finish the last bits missing soon.